Hi, I am interested in your 1984 Chevrolet C/K Truck 4x4 Regular Cab 1500 (stock #1000-NSH) listed on Autotrader for $23,995. I'd like to get more information about this vehicle and confirm its availability. The box body generation of Chevy pickups enjoyed a 15-year run of production with upgrades and redesigns along the way. In 1981 the body was resculpted in the wind tunnel which gave the front end the look you see here which is somewhat bowed at the front and smoothed out around the edges. These trucks are popular because they are good looking, well designed trucks that are perfect for both work and play. Check this one out. 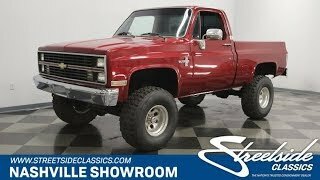 Its kind of funny that GM officially called this body the rounded line design, while the truck magazines started calling it box body or square body , probably because of the rectangular front end with the quad headlights, and the nickname stuck. GM used a wind tunnel to sculpt the body for improved aerodynamics and to help fuel economy which softened the lines and improved air flow through the engine too. They laid the windshield back at a steeper angle and rounded the edges of the cab and fenders. Regardless of the method and intent, the end result is what many consider to be the best-looking trucks ever made. This one has been nicely repainted in Maroon. The bumpers shine bright and it sits up on some serious rubber mounted on Mickey Thompson wheels. Silverado and Chevrolet badging appears on the fenders, tailgate, and grill and the bed is protected by black Line-X. Open the door and you will find a stock interior with the comfort and convenience features that will make your time in the cab enjoyable. The door panel has an assist grip, which may come in handy as the truck sits up a bit on those big tires, and once youre in, theres a big old armrest to relax onto and power window switches at your fingertips. The black bench seat is super comfortable and looks sharp in pleated vinyl providing plenty of room for three people to travel comfortably. An aftermarket custom steering wheel is mounted on a tilt column along with a shifter for the automatic transmission. Behind it is a stock dashboard with the speedometer in the center, fuel gauge on the right, and gauges for voltage, oil pressure and water temp off to the left. Ventilation controls include A/C for your comfort and there is an aftermarket AM/FM/CD player for your listening pleasure. The drivetrain on this truck is tried and true Chevrolet. Pop the hood and you will find a 5.0-liter motor tucked down in a clean and mostly original engine compartment. A chrome Summit air filter assembly sits on top of a Quadrajet carburetor and an Edelbrock intake manifold. There are nice, chrome, Chevrolet bowtie valve covers adding a splash of flash to the engine and long tube headers get the spent gasses out and heading downstream to Flowmaster mufflers making for a really good sounding truck. Power flows back through a 3-speed automatic trans and 4WD transfer case that is manually operated. The hubs are also manually operated at the wheels, so there are no pesky switches or solenoids in this system to malfunction. Solid axles and leaf springs front and rear are also as tough and reliable as it gets. The truck sits up nicely on those all black 35X12.50R15s mounted on the Mickey Thompson wheels which look like they mean business too. This is a great looking, great driving Chevy K10 Silverado. It doesnt get much better than this. Come on down and check it out.